Memorial Arch Ceremony & Wrap-Up of the 2017 R.W.E. 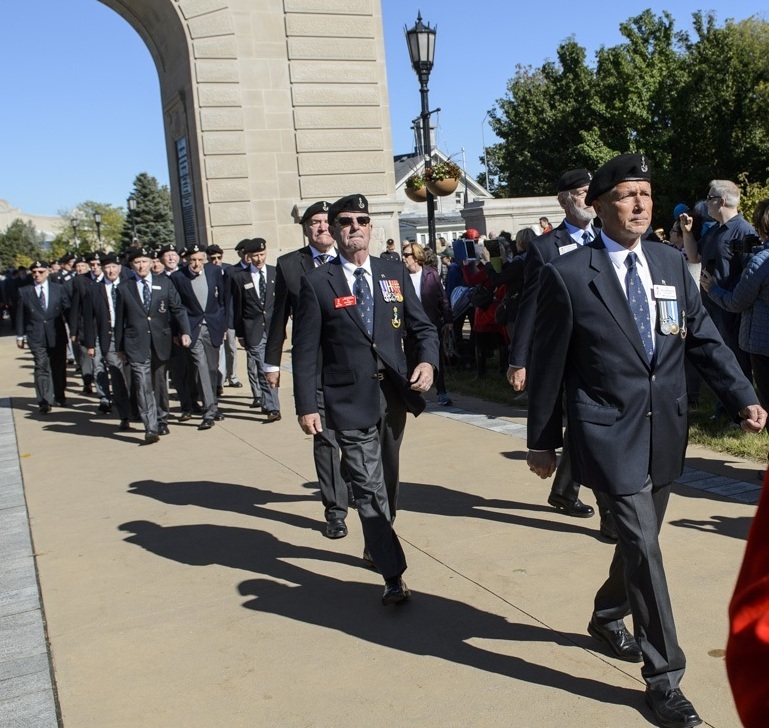 A Memorial Service to honour Canadian Military College Ex-Cadets who died while on duty was held at the Memorial Arch on Sunday. The mood was generally light and good spirited while the many classes did their best(?) to form up properly. There was a great turnout – the dress varied which should not be a big deal. The majority of the Old Brigade were in blazer, crest, baret and tie. The younger Ex Cadets did pretty good too. Led by members of the Old Brigade, the group started from the Parade Square and marched along Precision Drive, passed by the Wall of Honour and eventually ended up at the Memorial Arch. 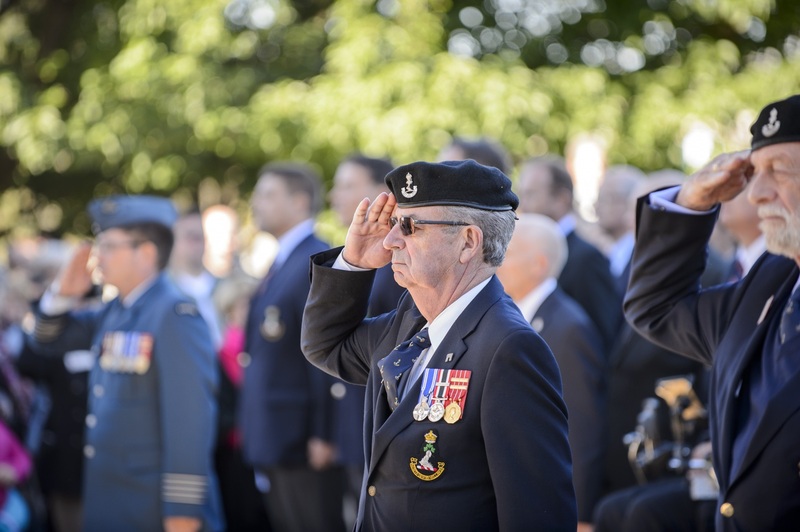 Taking the salute while they left the parade square was 2908 Al Pickering (Class of 1953) and a former Director of Cadets in the mid 1960s. While at the memorial the mood was serious and sombre. The Celebrant 8457 The Reverend Paul Robinson, did his usual highly professional service in setting the right tone for the occasion. The Roll of Honour of those SOS since last year (Reunion Weekend) drew the most silence – 75 names were read out by the Old Brigade, Adjutant 5611 Gerry Stowe. On the way back, out going RMC Club president, 5440 Tony Goode took the salute. First Year Officer Cadets lined the route along Valour Drive and they looked sharp. On completion of the Memorial Service, the Ex-Cadets marched back to the Parade Square where there was two impressive and touching presentations. 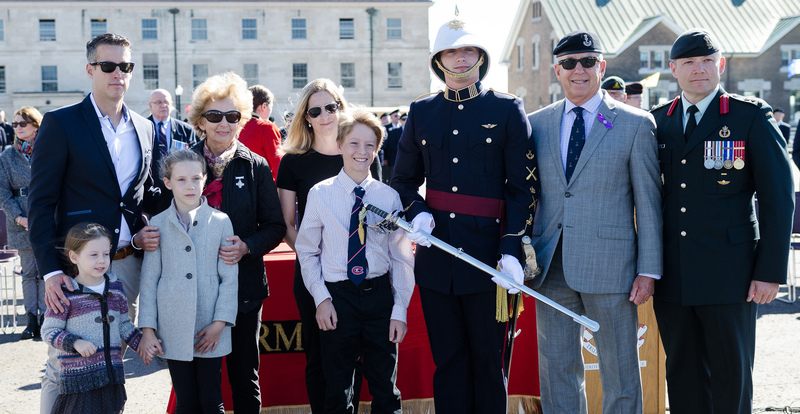 The Captain Nichola Goddard Memorial Sword is presented annually by the Goddard Family to the Cadet deemed to be the best ROTP artillery cadet entering fourth year. 22458 Captain Goddard, who graduated in 2002, was killed in action serving her country in Afghanistan on the 17th of May 2006. Her professionalism, exceptional leadership, and love for life will not be forgotten. The sword was donated by the late H17417 Honorary Colonel. Judge John Ross Matheson, OC, CD. The sword was presented by the commandant himself, 18777 Brigadier-General Sebastien Bouchard assisted by the College Chief Warrant Officer Garth Hoegi. 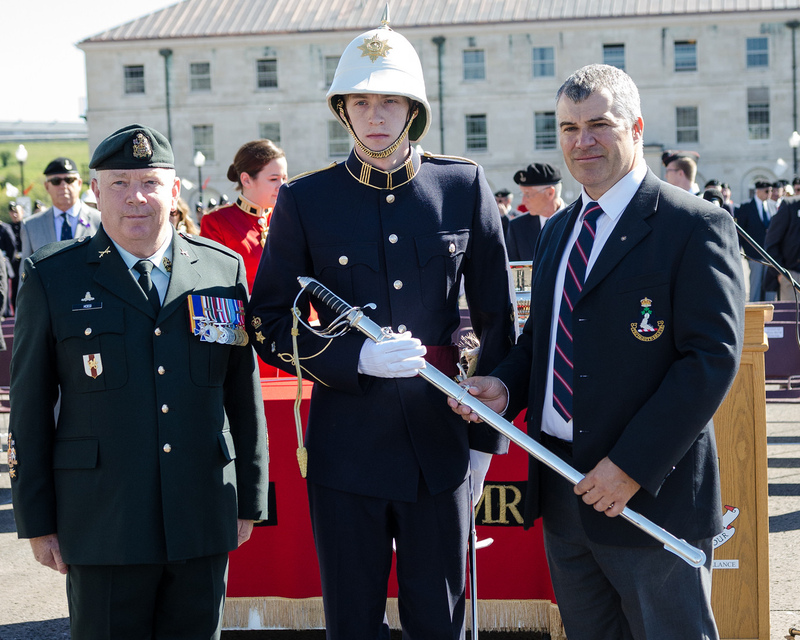 Next up was the Captain Matthew Dawe Memorial Sword which is presented annually by the Dawe family to the Cadet deemed to be the best ROTP combat arms cadet entering their fourth year. 22596 Captain Dawe, who graduated in 2004, was killed in action in Afghanistan on the 4th of July 2007. Captain Dawe was an outstanding officer and his many qualities serve as an excellent role model to any junior leader. The sword was presented by the Dawe family comprising his father S150 LCol (Ret’d) Peter Dawe Sr and his mother Reine, his brother 21751 James & two daughters of James, his wife 22621 Tara and his son Lucas. The sword was presented to the Cadet Wing Commander, 27304 OCdt Ryan Harding. 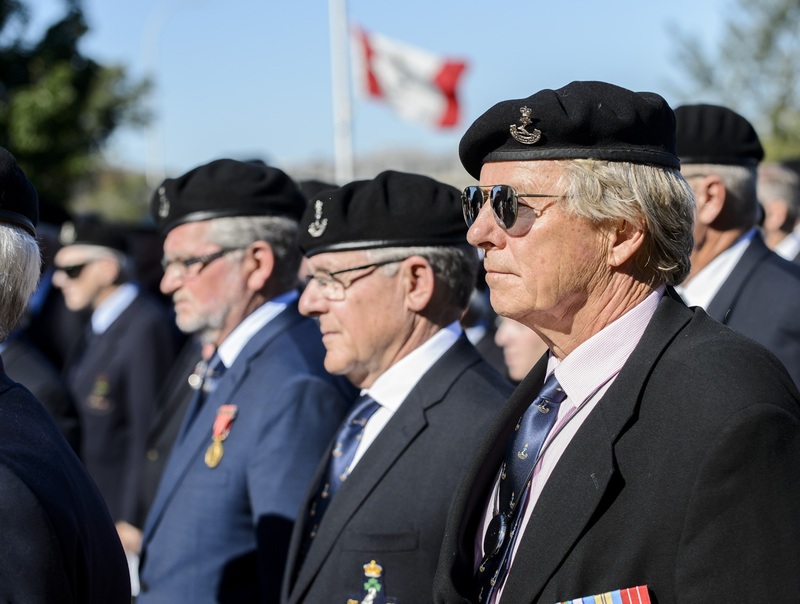 The parade is a demonstration to those outside of the Royal Military College and the Canadian Armed Forces that we are a dedicated and loyal group of individuals who have come together to work as one, striving towards the same common goals. I had the privilege of observing the memorial service parade on Sunday. It was humbling to watch so many first years and former cadets come together and march in memory of those we have lost. They truly embodied what the Royal Military College represents: truth, duty, valour. It is quite clear that, regardless of background, age, or gender, every single person who has been or is a part of this institution, shares the same core values. In addition, when times are tough and we are faced with the loss of one of our own, the entire college: past, present, and future officers, will stand side by side to honour their memory. This college is not defined solely by those who currently attend, but by all previous alumni. This ceremony serves also as a reminder to all the current officer cadets that although our time here at the college is limited, we will always be a part of it. For the Red & White results / presentations go the sports section.